One of the most exciting things about working in the field of digital marketing is that you wear multiple hats. At any moment you might be working on the next big social media campaign, writing content for the blog, interviewing guests for a new podcast episode, hosting a workshop, running an Instagram ad campaign, streaming Live, or editing a product video in Adobe Premier. At Buffer, we take a strategic, rigorous approach to our digital marketing strategy. This approach to marketing has helped us to grow to more than $19M ARR in just a few years. Digital marketing is the marketing of products or services using digital and online technologies, including various marketing channels and tactics such as blogging, advertising, video, social media, email, and much more. At Buffer, our digital marketing strategy revolves around each teammate delivering content or assets within a certain time frame for his or her role on the team. Whether it’s PR, community, social, content, growth, email, or data, we’re all focusing on working together. Over the past several years, I’ve had the privilege of overseeing the top-of-the-funnel (TOFU) digital marketing strategy at Buffer. Essentially it means that a lot my day is based around getting as many people (potential customers) into the top of our marketing funnel as I can through digital and offline content. Everything starts with why we exist. Buffer’s Vision: To give people a greater voice on social media and to create a workplace of the future. One of the main goals of digital marketing is to attract more quality customers to a product or service. Note: Quality is key when deploying digital marketing strategies. 4,000 leads doesn’t necessarily equate to 4,000 long-term customers (or even 4 for that matter). On small teams, digital marketers also need to take into consideration the entirety of the marketing funnel. In other words, once we get the customers in the door, where do they go? Do they stick around? Purchase more products? Leave a review? Tell their friends? In that sense, TOFU and digital marketing professionals take on the roll of what many today call growth. Where does Digital Marketing fit into the Buffer vision? Decide that our product is the best fit for their job to be done. Understand how to use our product to the fullest. This equates to creating content and prioritizing marketing activities that not only look to attract a large amount of new customers, but also to guide customers along the marketing funnel in a cohesive and strategic manner. These are generalizations. Implementation of growth strategies within companies can vary widely. We are in the unique position at Buffer to be able to move quickly between growth and marketing. This allows us to conduct data-driven experiments, while also thoughtfully planning campaigns that will help to drive overall brand awareness and product conversions. Much of our marketing success depends on the process of seamlessly integrating our growth goals with awareness + acquisition goals. It also depends deeply on the ability to deploy a fast, data-driven process to figure out what works and what doesn’t. We might test 4 to 5 different email sets (headlines, subject lines, audience, images, wording, length, CTA, etc) on any given day while working within the framework of our overall email marketing campaign. That email marketing campaign would be within the framework of our overall email goals such as blog traffic, open rate, CTR, etc. Data from the 4 to 5 various email sets must quickly be measured, analyzed, and reported so that we can work the learnings back into our next email campaign. We might experiment with 3 different video lengths and topics on Facebook while working within the framework of our overall Facebook marketing strategy. Our Facebook marketing strategy would fit within our overall social media strategy which is to educate, entertain, and drive traffic to Buffer assets. Data from the different video lengths and topics must quickly be measured, analyzed, and reported so that we can work the learnings back into our next Facebook video. Note: If you’re interested in learning more about frameworks, I recommend checkin out Jim Collins’ classic piece of high-performing companies, Good to Great. Cost : The upfront and ongoing cost to acquire users in this channel. Targeting : The depth of ability to target different audiences. Control : The control you have over turning the channel on/off at will. Input Time : The upfront time required to start running experiments with this channel. Output Time : The time it takes to start getting data around your experiments. Scale : The size/reach of the channel. 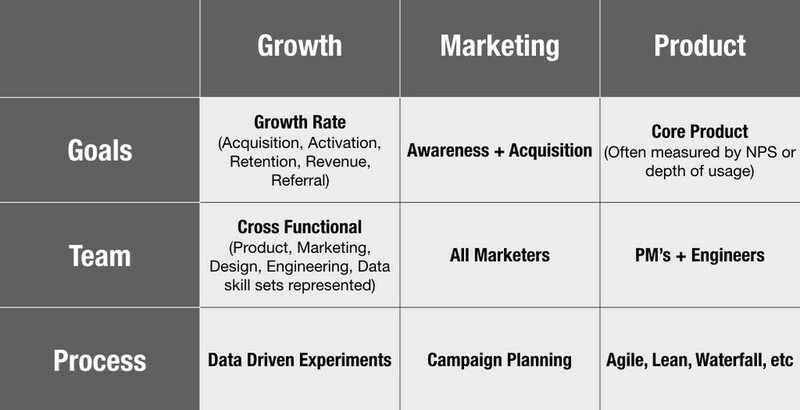 Operating under this framework will help to prioritize marketing channels in order of importance. It’s crucial to remember, though, that this is only meant to be the beginning. At this point we have a hypothesis about a customer acquisition channel. We’ll benefit from setting up and running a number of experiments to prove out the viability of the channel in relation to overall growth goals. Setting BHAG (Big Hairy Audacious Goals) against the areas we’d like to grow in. Continually feed the machine with new ideas and experiments. Measure experiment data (did it work or fail?). Sharing our learnings with team and iterating on experiment process/implementation. One of the biggest strengths of social media is its ability to drive a huge amount of word-of-mouth marketing in a short amount of time. It’s also a great tool for providing educational & entertaining resources that are timely, easy-to-digest, and unique to individual platforms. Provide value (education or entertainment) unique to the channel its shared on. Provide content so valuable/relatable that people are moved to share it with their network. Humanize the Buffer brand through authentic and transparent learnings. As organic reach on social media continues to drop and social platforms move to more “closed” environments, it’s important for companies and brands to have “owned marketing assets” of their own. A blog is one great example and another is a company’s email list. Our email newsletter (and list) will serve as an important peripheral marketing channel with a focus on driving additional traffic to our blog outside of organic search and social media. Quality and segmentation of our subscribers. Efficient and data-backed A/B tests. Valuable, unique, and interesting content delivered consistently. Not only is email a great way to “push” out information to our current and potential customers, but it’s also a great way to “pull” knowledge about our customer database and enrich our insights into content preferences and demographic information. Data from 2019 points to the fact that video is one of the best ways to reach our audience on social media and provide value to current and potential Buffer customers. Video content will be one of our content cornerstones with a focus on marketing thought-leadership, social media education, company culture, and entertainment. Consistency across all major video sharing platforms (daily video is optimal). Topic research, headline optimization, and thoughtful delivery of content. Creativeness and willingness to think outside of the box. Due to the nature of video, we will be extra diligent in tracking the success of our video marketing efforts. What’s working? What’s not? Can we deliver video content in more effective and efficient ways? Question #1: What is your marketing goal for this campaign? Question #3: What are the best video analytics to measure your KPIs? Question #4: How will you optimize for engagement? Content, when thought about under the umbrella of “Growth Strategy” has many facets. Growth content is optimized for SEO, has all of the parts required for social shareability (uniqueness, great headline, valuable), is optimized for click-throughs and email subscribers, and much more. In this particular case, I am referring to content as a means to increase awareness. Therefore, content developed under Growth will focus more on virality (created and optimized for sharing across networks). Thorough topic research on current, trending topics using a tool like BuzzSumo. Partnering with peer companies, brands, and influencers to leverage audiences. Creating unique content assets for each social media channel (80% promotion rule). One highly “personal” digital strategy that has seen exponential growth over the past several years is podcasting. Audio content presents us with the opportunity to reach new customers where and when they want to be reached. The Science of Social Media has received more than 2 million downloads since its launch in September 2016. Since being featured on Apple’s News & Noteworthy, numbers have leveled out to around 15,000-20,000 downloads per episode. Maintaining an extremely high quality bar (audio and content). Examining trends in our data and in the industry to formulate successful show topics. Experiment with and perfect show format to find “what works” with our audience. Utilize essential marketing tactics to ensure maximum episode promotion. Create and maintain a podcast newsletter. Write weekly show notes for accessibility and discoverability (SEO). Facebook and Instagram advertising works in a variety of digital marketing situations — from collecting emails to directly driving sales of a product. In most cases, however, Facebook and Instagram ads are effectively used as a supplemental marketing strategy with the goal of amplifying the various content pieces we’re creating. It is very important for us not to use Facebook and Instagram advertising as a crutch, but as an amplification tool. In other words, our Facebook marketing and growth strategy will look to maximize organic reach before using ads to promote our content even further. Content with a high engagement ratio (engagement / reach total * 100). New or important product/company announcements. Videos with a high video view ration (video views / reach total * 100). Partner/curated content that has organically reached more than 20,000 people. The main goal of digital marketing is to attract more customers to a product or service. We will look to strike the delicate balance between traditional awareness +acquisition marketing and retention + revenue + referral marketing. This allows us to conduct data-driven experiments, while also thoughtfully planning campaigns that will help to drive overall brand awareness and product conversions.